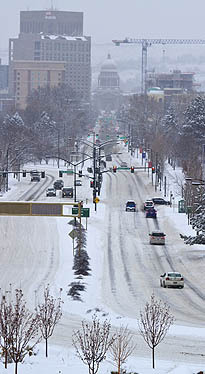 Boise Guardian | Winter Wonderland or Snowy Nightmare? Winter Wonderland or Snowy Nightmare? No school for the kids, but for most folks it’s another day of clearing snow. After clearing the world headquarters for the Boise GUARDIAN, we ventured out to capture some images to share with readers. We can’t really fault ACHD for their priorities on snow clearance, but it does gall us a bit to see the folks in the foothills on “6% grades” get more service than those of us who live on the Bench. money talks. the Bench is considered ‘working class’. The Northend alleys are taking their toll on trash pickup. I think no place has it much better than others with the exception of downtown. Riding my bike today seemed a much easier task than driving. During this recent set of storms I have pondered a few things. 1. If people want their streets cleared they would need snow removal. In order to do this all cars would need to be removed from the road and then the snow would need to be hauled off. You can not just shove this much snow to the side. This cost money in the form of large amounts of equipment that may sit waiting for the next large storm in 10 years. Yes, the roads are a mess, but are you willing to put out all the money for the equipment necessary?? 2. We live in a great community! Yesterday I saw many people helping to shovel, pushing cars, sledding down new piles of snow and generally people in a good mood. 3. Check on your neighbors. If you notice that the elderly neighbor has not made a path from their door to the mail box, please check on them. The weather is turning from snow to bitter cold the next few days. 4. 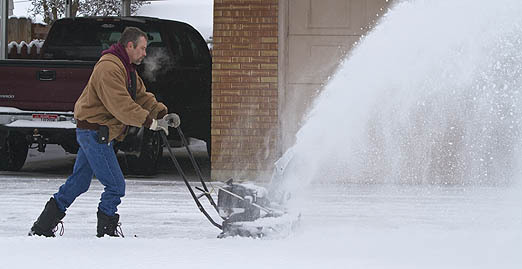 Be kind to the guy that is actually out there plowing or shoveling an area. Stay out of there way, move your car so that they can clear the snow around you. Yes, they are getting paid for the job they are doing, but a thank you and maybe a hot cup of coffee would be a welcome treat. He may be the guy that pushes you if you get stuck. 5. If you have a fire hydrant in front of your house. Clear a space around it. The last thing you want the fire department to do is be looking for the hydrant if your house is on fire. 6. A big shout out to all of those people out there working in this weather. Firemen, policemen, snowplow drivers and letter carriers just to name a few. EDITOR NOTE–ALL GOOD POINTS. AMEN! From all of us here at ACHD a very heartfelt thanks. Our drivers are instructed to be good Samaritans. A few weeks ago one of our guys got out of his truck to help a lady out who’d slid off the road. He slipped, injuring himself. He’s had 2 hip surgeries as a result but we’re not changing our Good Samaritan policy. 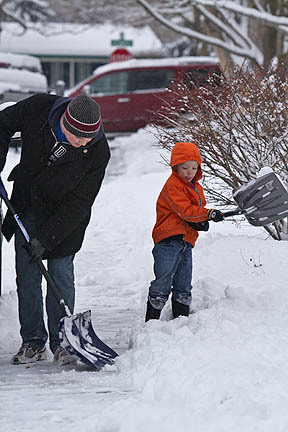 Our director lost his elderly father in law to a heart attack due to the elderly gentleman going out to shovel snow. Yes, be careful out there and take note of your neighbors. Thanks Dave. But all this global warming is really chilling my bones. As I walk around and drive around, I notice a couple things- St Lukes and St Lukes have AMPLE resources to clear their sidewalks to neat perfection. BSU, and to some degree the City of Boise as well. Parks is saying, our priority is plowing parks… (even though people can’t get out of their neighborhoods to drive TO the parks). Is that because the govt agencies and quasi govt agencies have too much of our money and are readily able to spend it? Then I see a newscast, ACHD explaining their current snow policy. There is not 1 but 2 ACHD PR reps. No Quintana, no commissioners. Maybe less public relations salaries would equal a little more plow drivers. Quintana, in an interview, says, “You don’t plan for the exception”. Good-bye insurance, cash reserves, Plan B, Strategic Defense Initiative, fire alarms, smoke detectors and EVERYTHING that allows for “the exception” to be mitigated. 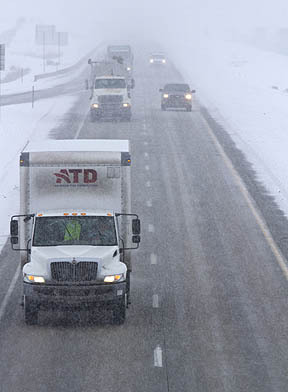 The record is clear- ACHD is not good at managing all of our roads when snow and cold hit. Throwback Thursday- 2 years ago in November. ACHD said, “We screwed up”. Either pay more money to buy your own (HOAs) snow removal to get on the arterials, or pay more in taxes and entrust it to ACHD to PLAN for the occasional s-storm. Time to get on my atv. Your comment on the foothills folks getting a better deal is right on. That’s because the property tax has no relation to services received. Perhaps a surcharge on foothills residents for road maintenance is in order. And one for people who choose to live abutting fire-prone lands.